With Chameleon's Intercom integration, you can coordinate Chameleon tours with Intercom messaging and data. 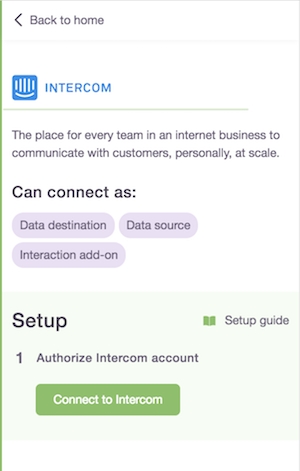 To learn about Intercom visit our integration page. The Intercom integration is very quick to setup - do so from within the Chameleon Editor, within the Integrations section. Simply hit "Connect to Intercom". This will launch the Intercom OAuth flow and redirect you to a permissions page like this. Check that you are connecting to the correct Intercom app in the top right of the screen and then hit Connect. You should then be redirected back to the page you left with the Chameleon Editor. That's it! You'll now be able to use the Intercom integration as below. Chameleon will automatically send tour performance data, for each user, to Intercom. You can view this within Intercom on any user record. Step Seen (Chameleon) -- by request, to avoid flooding you with events. Event properties sent as part of these events include the Tour name, URL and others (e.g. Step number) where relevant. This can be helpful to troubleshoot whether a particular user saw a specific tour or not. You can also use this to send a message from within Intercom, although Intercom does not (yet) allow you to use the event properties (such as Name of tour) as part of your filtering criteria. 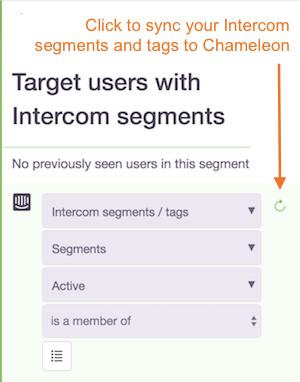 You can use Intercom as a source of user data to help with targeting Chameleon tours, using Intercom segments and tags. 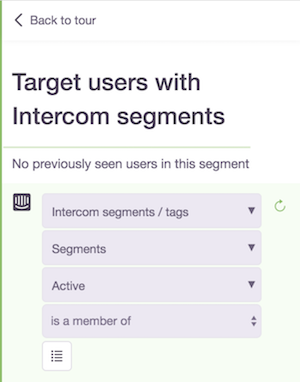 Intercom segments are dynamic groups of users within Intercom (changing based on attribute and event conditions) and Intercom tags are static groups (you can manually apply tags to any user, based on a manual search or filter). Once you have connected Intercom, your Intercom segments and tags will appear within the Intercom filter when creating or editing a segment within the Chameleon Editor. You can set up these segments using all the events and user attributes available within Intercom. Note: Users are updated with their segment information every ~1 min. They are updated with tags information in real-time. If you would like real-time updates of segments then please email Intercom to support this. 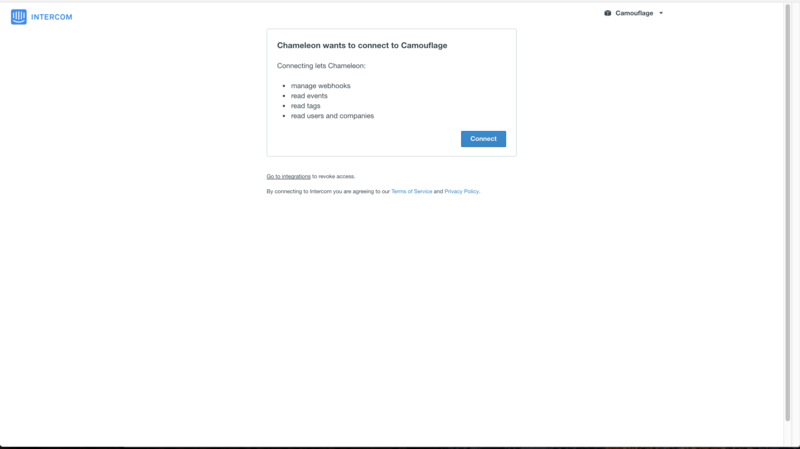 To connect Intercom messaging with Chameleon tours even more deeply, you can now launch an Intercom chat message from a Chameleon tour step. You can pre-configure the default message content, and use this to begin a conversation with users. To do this, add this user action as part of any step button. Not seeing Intercom within the list of filters. This could happen if you are on the "Lite" plan as the Intercom integration is not available for your plan. Not seeing your Intercom segments or tags in the list. Please make sure you have connected the correct Intercom account. Currently we only support a single Intercom account connection. You can manually sync your data by clicking the refresh icon. We're always looking to improve our integrations, so please do let us know if you have any ideas by sending us a message from the bottom right chat bubble!